Are you looking for a “smart” alternative to an ordinary dimmer? The Lutron MACL-153M-WH in white may be just the solution are looking for. This intelligent device does more than simply save you energy and extend the life your bulbs; it remembers your favorite settings. Don’t remember how to find your favorite light? No problem. Simply tap the main button once or tap twice for maximum light. Keep in mind that the Lutron MACL-153M-WH has more than just a good memory. Exit rooms safely without worrying about the lights. Lights fade out as you safely exit the room. Additionally, it gives your room an elegant, functional touch. The soft green LED lights indicate the current brightness level and act as a locator in the dark. You’ll never look at ordinary dimmers again. The Lutron MACL-153M-WH in white is the perfect accessory for any room in your home. Wallplate Sold Separately. 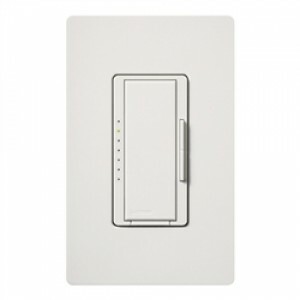 For matching appearance use with Lutron's Satin Colors Wallplates. One (1) Year Manufacturer Limited Warranty. /BR>The warranty is provided by and needs to be proceeded through the manufacturer. overall very good product !